I don’t know about you but when the outdoor temperature rises and the days start getting brighter and longer I can’t think of a better time to get my hands into soil and play around with some fun plant experiments for Spring! This morning I went to my trusted florist. She was creating a sort of suspended moss ball with a little citrus tree. Since I am always curious about many things, I asked her what it was. 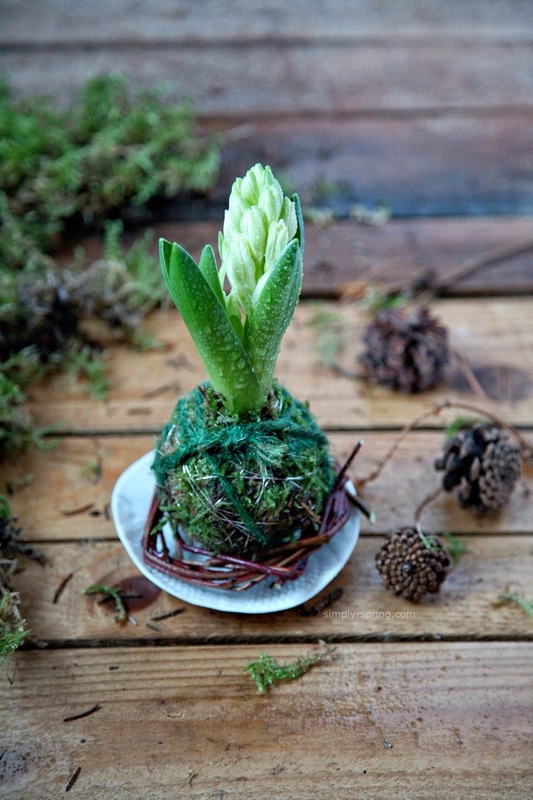 It's called Kokedama but also known as moss ball and comes from Japan. In simple terms: wrapping a plant in moss instead of putting into a container. Funny not? I’ve seen Kokedama for the very first time in New York, some years ago, but I didn’t know the name and origins. These wonderful planets of moss looked great hanging in a living room. They were delicately beautiful but I never realized how easy they are to create. Considering that this traditional Japanese art form it's mucky, it's creative and green, I can define it's my latest craze. 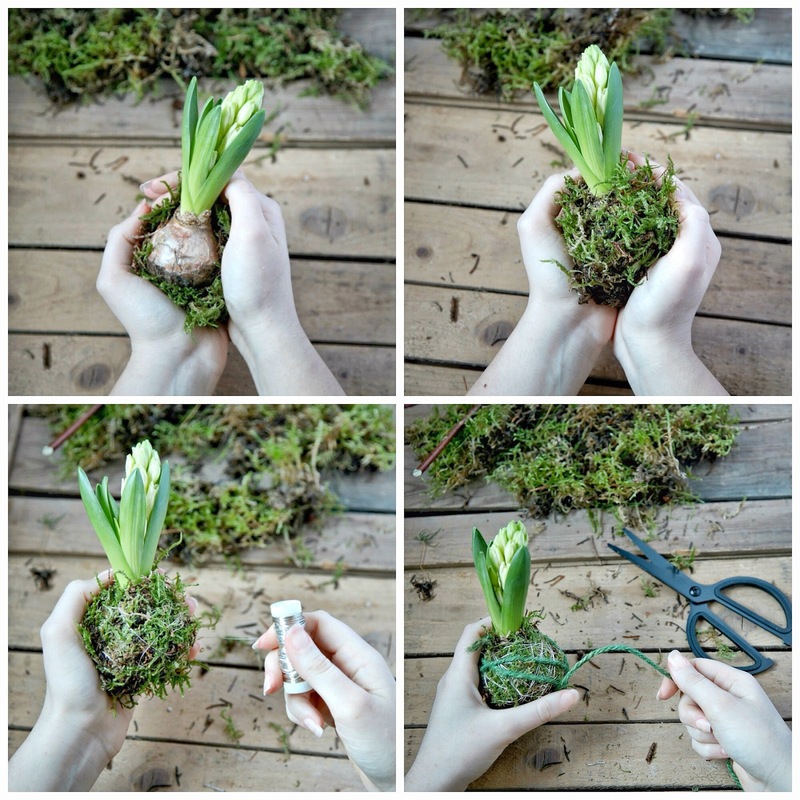 So I came back home with a few small plants, bulbs and I'm ready to make my Spring Kokedama and show you how to create your own. Take your plant from its container and remove the soil from the roots. Be very careful to not break the roots. Spray water to clayey soil and stir until moist. You need to add enough water so that your soil becomes moldable. Do your best to form a ball shape around the roots with the soil-water mixture. If needed, spray the soil with water to keep it moist and workable during this process and remember to squeeze and mold without breaking your plant. 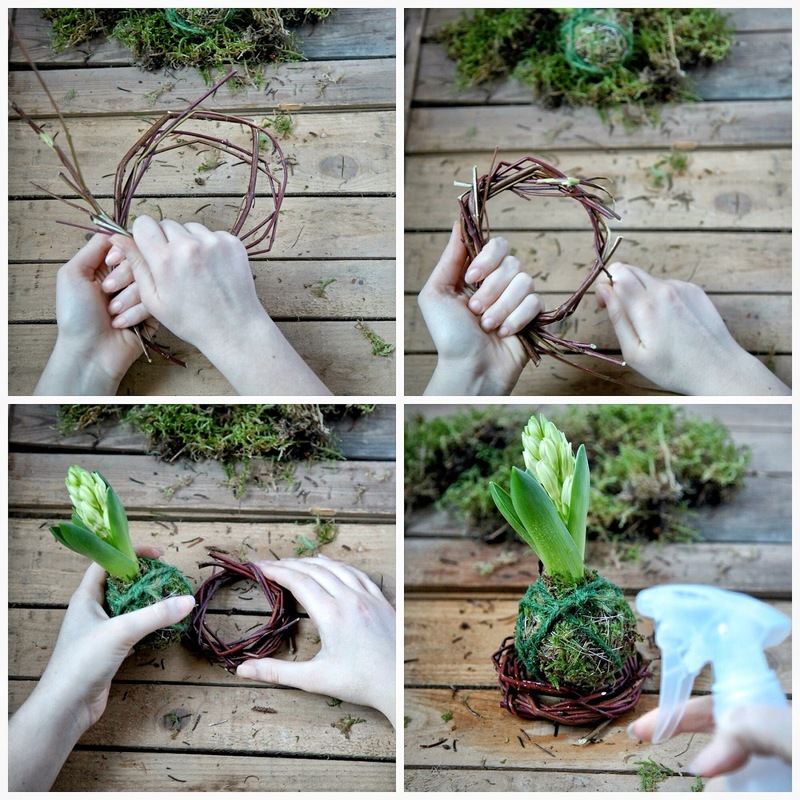 Wrap with living moss and tie with metal thread and then with twine. Once you are happy with your new Japanese garden you can create a wreath to display it. Twigs must be thin and flexible. Hold the cut end of the twigs in your left hand, and with your right hand bend the free end into a circle, approximating the desired proportion of the final wreath. Clasp that section of the twigs with your left hand. Your hand now holds the loop that will become the wreath. You can use this wreath as a stand to hold your Kokedama on your desk or place it over a bowl. - Display your small green planet in a bright location. Avoid any direct sunlight exposure and keep Kokedama away from hot or cold air drafts and hot spots (radiators, direct heat, or television sets). - To keep your Kokedama alive and happy, spray water to keep the moss moist at least once a day, especially in summer. Occasionally add fertilizer to irrigation water. 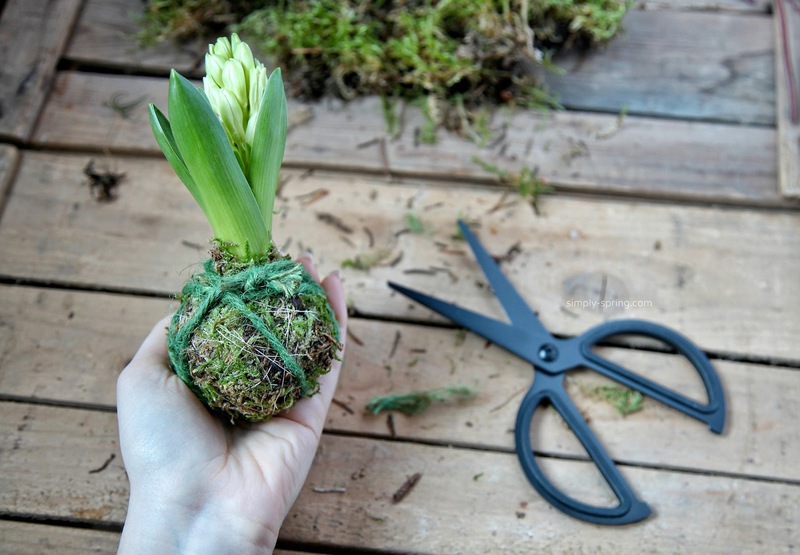 - If the moss becomes dry and your Kokedama very light, you can submerge the sphere in a bucket of water and organic fertilizer for five to 10 minutes. 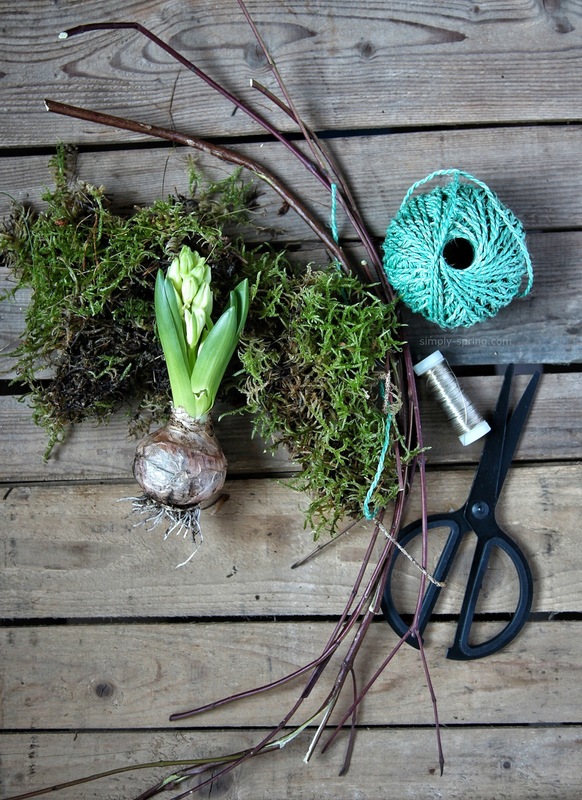 - I used a bulb of white hyacinth because I love the sweet scent of Spring this beauty offers but you can use any bulbs, seasonal plants or plants are easier to grow if you haven’t a green thumb. - I asked to my florist if I can plant also mini cactus. She told me to avoid any succulents and cacti, as the soil ball will remain too moist for these types of plants. - Plan to make your wreath as soon as possible after the twigs have been gathered, before the canes dry out and become hard to work with. If you can't get to the task right away and the canes do get a little brittle, try soaking them in water for a few hours to restore their flexibility. - You can also create a suspended Kokedama with a little tree (for example lemon tree or Kumquat) for a personalized gift or an interesting accent of modern art.